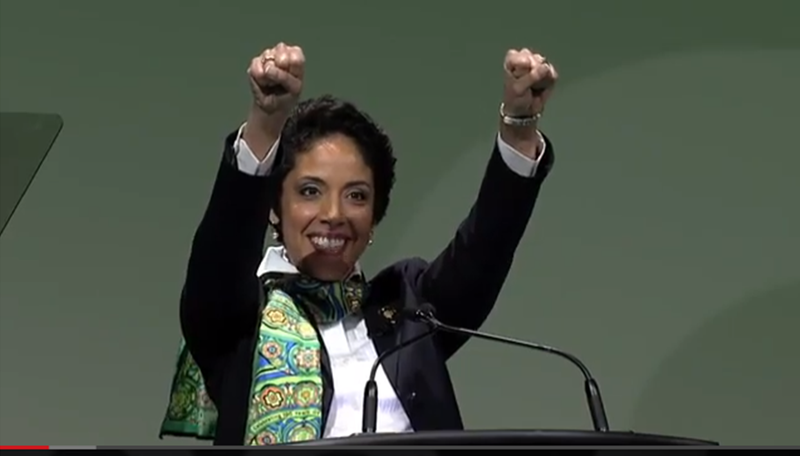 When Anna Maria Chavez became the CEO of the Girl Scouts of the USA, she walked into a job with a description that might daunt a lot of us. Since taking the helm in 2011, Chavez has been tasked with nothing less than revitalizing a century-old institution while staying true to its cherished traditions. Financial troubles plague several of the organization's chapters, and membership has been declining since 2003. As the group's first Latina leader, Chavez has managed an aggressive campaign to increase minority membership and to re-direct some of the organization's focus toward 21st-century skill building and leadership development for girls. Some of the changes she and her colleagues have sought, from camp closures to chapter mergers to staff shake-ups at the national headquarters have been controversial inside and outside of membership ranks. So I ran home and told my parents and my grandmother, my Nana, that I was going to Girl Scout camp. And my Nana, she said, 'mi hija, no, no, no, we came from the migrant camp, we don't go back that way.' But I wanted to go, and so I went! Don't be afraid to step away from the lectern. Chavez is an enthusiastic speaker, full of big gestures. It's entirely appropriate for her to convey her enthusiasm with these outstretched arms and movements across the stage. The National Convention is a rally of sorts, and she was there to get everyone fired up for the year ahead. If appropriate, make it personal. Her speech is full of tales from her own long history with the Girl Scouts, but these tales also serve as vivid illustrations of what she thinks the Scouts can offer. It's one think to hear that the Scouts encourage girls to take on leadership roles. But it's another to "see" it, when Chavez describes how an early Scout camp experience showed her how to tackle vandalism she saw during a family desert hike. Try out some classical rhetoric techniques. Chavez uses the Girl Scouts' "courage, confidence and character" motto throughout the speech, taking advantage of the alliteration to make her message stick. She also closes the speech with a call-and-response, asking, "Do you see her? Do you hear her?" as a way to get her audience thinking about their own roles in the lives of future Scouts. Freelance writer Becky Ham contributed this Famous Speech Friday post. If you found this post useful, please subscribe or make a one-time donation to help support the thousands of hours that go into researching and curating this content for you.